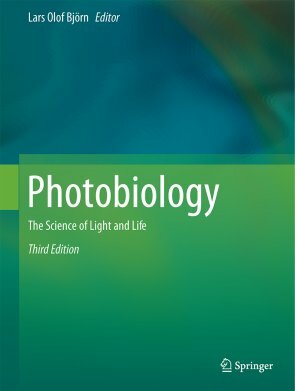 Photobiology [the science of light and life], 3rd Edition. Edited by Lars Olaf Björn. Springer, 2015. As botanists (for such I assume most of this blog site’s readership are) we are acutely aware – and more so than most other biologists – of the importance of light in biology. Not only is sun-driven photosynthesis the driving force that powers growth of plants and plant-like organisms, but light – in terms of its quality and/or quantity – also plays major roles throughout the life cycle of flowering plants, e.g. photoblasty (in germination of some seeds), phototropism and photomorphogenesis (to ensure proper growth and development of the developing plant), and photoperiodism (during flowering). And, we also acknowledge that excess light – and not just from wavelengths of the visible spectrum – can be damaging to plants via photoinhibition and photooxidation. But, as biologists – whose plant subject matter interacts with all other organisms on the planet – we also need to be mindful of the bigger role that light – particularly, although not only, sunlight’s visible spectrum, but also the heat-giving infra-red wavelengths, and frequently DNA-damaging UV component – plays in the biology and ecology of all living things. And book’s like Björn’s Photobiology attempt to do precisely that. Indeed, pointing out that different disciplines that deal with light and life have more in common than might at first be apparent, and that the same principles apply to seemingly different areas of photobiology, is one of the book’s goals. But, as its Editor recognises photobiology is such a big topic it is impossible to cover all aspects in one volume. Accordingly, choices have to be made, which will to a greater or lesser extent reflect the interests, etc. of the Editor, and what topics are currently topical. Fortunately, the Editor’s interests are rather broad, and Photobiology’s 29 chapters provide a great overview of photobiological research and understanding at this stage of the 21st century. From an ‘opportunity-to-follow-up-the-work-highlighted’ point of view each chapter not only has a list of references at the end of the contribution, but also has them cited in-text (I do like to see that integration!). And, to help readers find their favourite topics, there is a pretty substantial 2-columned Index that spans approx. 10.5 pages [and yes, my plant model species colleagues will find many entries therein for Arabidopsis…]. Whilst one might be tempted to view light solely in terms of quality – colour or wavelength, or quantity – how strong the light is and how long a period of time it is experienced, the all-important Chapter 2 – “Principles and Nomenclature for the Quantification of Light” – soon demonstrates how vague such notions are, and corrects that overly-simplistic view very early on in the book. Light is tricksy, so much so that that that chapter could deter all but the most photocurious from reading further. But, it is worth making the effort to appreciate that chapter’s contents, and important message. After all, such an appreciation is crucial to interpreting any investigations that attempt to unravel the relationship between ‘light’ and life, consideration of facets of which are the subject matter for most of the remaining chapters. Photobiology spans the spectrum of light-life interactions, and has a broad temporal and ecological range. Thus, we have a most ancient dimension from a chapter dealing with the role of UV in the origin of life on Earth to one that represents a clear and present – and future? – danger in examining the damaging effects of UV on the ozone layer (which might arguably lead to the elimination of life on Earth if uncorrected…). And both terrestrial [Ch. 6 Terrestrial Daylight] and aquatic [Ch. 7 Underwater Light] environments are considered to give a broad-based ecological/ecosystem perspective. There is plenty in Photobiology of a photophytological nature to satisfy the direct interests of even the most discerning of plant biologists, e.g. photomorphogenesis and photoperiodism (of animals too), photosynthetic light-harvesting, evolution of photosynthesis, cross-talk between plant photoreceptors, and spectral tuning (pigments). And plant dimensions also feature in several other chapters – e.g. light-promoted infection, and light-resetting of circadian clocks, underlining the cross-Kingdom relevance of many photobiological phenomena. Plant biologists will also be introduced to such non-plant phenomena as The photobiology of human skin, and The diversity of eye optics (of direct relevance to plant biologists though because they are humans that have eyes…). In other words, Björn’s vision for the book – of providing basic knowledge that can be of use to all photobiologists and then giving some examples of special topics – has been admirably realised. And has been so realised for some time given that Photobiology is now in its 3rd edition. Some books are described as labours of love: I get the feeling that Photobiology is in that category. And the love that Björn has for photobiology is evidenced in the book’s 29 chapters, 14 of which he has sole-authored, and a further 8 he has co-authored. This is also testament to the breadth of interests of one who is generally described as a botanist, but whose knowledge also extends to such non-phytological topics as vision, the photobiology of skin, and bioluminescence. But Björn is also a man on a mission, to encourage others to take up study of photobiology. And there is plenty of encouragement so to do in Chapter 28 entitled “Hints for Teaching Experiments and Demonstrations”, which includes such topics as bioluminescence, UV damage to microbes, phytochrome and seed germination, studies on the xanthophyll cycle of leaves, and photosynthesis [in the non-plant meaning of the word] of previtamin D. Photobiology is therefore not only a collection of academic reviews and viewpoints, it’s also a great resource for teaching, and student projects. And another indication of the Editor’s passion for this area of scientific enquiry is the book’s – and Björn’s – final chapter that gives instructions for construction of a home-made spectrophotometer with which to undertake your own investigations into many aspects of photobiological phenomena. Whilst I recognise that there are limits on what can be included in such a tome, as a botanist it would be interesting to have contributions that deal with other types of light – e.g. starlight and ‘moonlight’ (e.g. Raven and Cockell, 2006) and ‘alien’ suns, infra-red light from hydrothermal vents (e.g. Beatty et al., 2005), and artificial light in urban and rural settings (e.g. Bennie et al., 2015) – and their interactions with living things. Or consideration of the implications of photosynthesis by organisms that can apparently use wavelengths beyond the usual 400-700 nm range of photosynthetically-active radiation (PAR), e.g. chlorophyll f-containing stromatolite cyanobacteria (Chen et al., 2010), and the prospects for engineering crop plants to increase yields in our food security-conscious times (Chen and Blankenship, 2011). Maybe topics for the 4th edition of Photobiology..? Photobiology is a great publication and has opened my eyes to the wider photobiology beyond my rather narrow plant-focused studies. Photobiology is/was also a fitting – and timely – tome for 2015, the International Year of Light [http://www.light2015.org/Home.html]. Beatty JT, Overmann J, Lince MT, Manske AK, Lang AS, Blankenship RE, Van Dover CL, Martinson TA and Plumley FG (2005) An obligately photosynthetic bacterial anaerobe from a deep-sea hydrothermal vent. PNAS 102: 9306–9310. Chen M and Blankenship RE (2011) Expanding the solar spectrum used by photosynthesis. Trends in Plant Science 16: 427-431. Chen M, Schliep M, Willows RD, Cai Z-L, Neilan BA and Scheer H (2010) A red-shifted chlorophyll. Science 329: 1318–1319. Raven JA and Cockell CS (2006) Influence on photosynthesis of starlight, moonlight, planetlight, and light pollution (reflections on photosynthetically active radiation in the universe). Astrobiology 6(4): 668-675.